The Lakota, Nakota, and Dakota people of the Seven Councils Fire (Očhéthi Šakówiŋ) often refer to horses as the “Horse Nation.” In the Lakota language, the horse is called šúŋkawakȟaŋ or “holy dog”—a name that suggests its connection to the spiritual realm. After their arrival on the Great Plains in the 1800’s, horses revolutionized life for the Očhéthi Šakówiŋ. They served as allies in hunting and in battle, but they were revered for more than their utility. Horses were recognized as relatives and incorporated into ceremonies as a source of healing energy. As the Indian Wars came to end, American Indians struggled to settle and preserve the small territories that the U.S. government called reservations. Horses, which had become so central to our culture, were largely forbidden. The big herds were destroyed. The government tried to sever our bonds to each other, to the land, even to the horse. These policies cost us dearly, but they did not succeed. Our tribes survive. We hold on to our reservation lands. Among many of our people horses still hold a prominent place in our world. He means too much to us, our ‘holy dog;’ the spirit that binds us could not be fully broken. The Horse Nation is our ally, now and forever. Today, across Očhéthi Šakówiŋ communities, horses are helping to renew and rebuild tribal and cultural identity. Each December in South Dakota, hundreds of individuals ride almost 200 miles on horseback to retrace the steps of Chief Big Foot and his band, ending at the site of their massacre at Wounded Knee. Horses are often used as healers in therapeutic programs in Očhéthi Šakówiŋ communities, helping people recover from painful challenges like addiction and depression. And Native artists continue to incorporate images of the horses into their work to honor their beauty, power, and resiliency. The powerful and irrevocable bond between the Očhéthi Šakówiŋ and the Horse Nation is the subject of a groundbreaking exhibition set to open at The Heritage Center in the fall of 2016. More than a year ago, Heritage Center Director Mary Maxon started a series of conversations with artist and filmmaker Keith BraveHeart about a potential exhibition celebrating the Horse Nation as it is seen through the eyes of the people of the Očhéthi Šakówiŋ. Since then, Maxon and BraveHeart have been in the process of creating Horse Nation of the Očhéthi Šakówiŋ, an exhibition of contemporary art, songs and stories honoring the horses as a spiritual kin. Keith BraveHeart has been exploring and documenting the powerful connection between horses and the Očhéthi Šakówiŋ for over four years. Raised on the Pine Ridge Reservation, BraveHeart studied art at the Institute for American Indian Arts in New Mexico. He emerged as a visionary painter who explores the complex collision of ancient Lakota culture and spirituality, and modern, Western society in his work. Although BraveHeart’s work has captured the attention of collectors across the country, he always knew he would make his home on Pine Ridge, surrounded by his family and community. Upon returning to the reservation, BraveHeart began working with Tiwahe Glu Kini Pi (TGKP) or “Bringing the Family Back to Life,” an organization devoted to supporting children who are struggling with Serious Emotional Behavioral Disturbances (SEBD). The program applies a holistic, Lakota approach to mental health services. It uses equine assisted therapy to help young people rediscover the cultural and spiritual connection between horses and their people. BraveHeart watched as children’s lives transformed through their work with horses. Reconnecting with the Horse Nation helped them heal from trauma, grief, addiction, depression, and more. To tell that story, BraveHeart began working on a documentary called We Are a Horse Nation. He completed the film in 2014 and it has been screened in museums and theaters across the region. The documentary shares a profoundly beautiful story about the interconnectedness of the Lakota people and horses across the centuries. Told by Native people in their own voices, it dispels the prevailing myth that poverty and its related challenges have overwhelmed reservation communities. Instead, it reveals that cultural and spiritual traditions are alive and well and providing healing energy for Očhéthi Šakówiŋ communities. As an artist, BraveHeart wanted to integrate images into the film illustrating how people of the Očhéthi Šakówiŋ visualize the Horse Nation. He approached Maxon about using pieces from The Heritage Center’s collection. Over a series of months, they spoke at length about how Native artists have portrayed horses in their work and about ways they might carry on the message of BraveHeart’s film in another form. Together, they decided that an art show and exhibition—featuring work inspired by Očhéthi Šakówiŋ people—could help to spark powerful conversations about culture, identity and community. From the very beginning, Maxon knew that the Horse Nation exhibition would represent a turning point for The Heritage Center. Although The Center has always highlighted the work of Native artists, this shift would focus on connecting more with Native people to inform its programming. Maxon and BraveHeart immediately recognized that this exhibit would—and had to—be different. “For many years, museum curators simply decided what went into art shows—but that has changed over the last few decades. More museums and galleries are exploring a community-influenced model by going into communities and talking directly with people about what interests them so that community members can stand in that museum or gallery and connect to art on a more personal level—to relate it to their own lives,” said Maxon. Maxon has worked in museums for over 25 years, serving as a curator at a range of institutions, from the Field Museum of Natural History in Chicago to the Idaho Museum of Natural History to the Dahl Arts Center in Rapid City. She also understands what it means to be an artist; she has worked as a sculptor, mount-maker and a graphic designer. In that time, Maxon has worked closely with Native art and artists for over a decade, but she says she is well aware of her position as a non-Native. “This is not my culture, so I see my role as moving the Horse Nation exhibit forward, keeping it on track, and setting up new ways for the community to get involved and share their perspectives. But it’s crucial that this project is directed by community members themselves,” said Maxon. 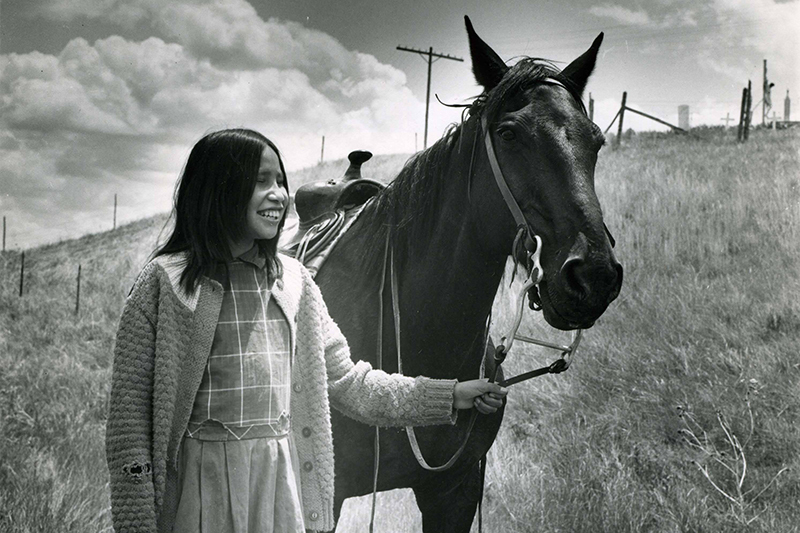 To create the exhibition, Maxon and BraveHeart are speaking with people from Očhéthi Šakówiŋ communities living in Minnesota, North and South Dakota, and even into Canada to explore the significance of the Horse Nation. They organized a series of community gatherings to facilitate dialogue between elders, artists and other culture bearers, and BraveHeart is interviewing artists across the region to understand how the horse inspires and influences their work. In December of 2014, a group of nearly 135 community members—including many from the Očhéthi Šakówiŋ—gathered at Rapid City’s Dahl Arts Center for the premier screening of We Are a Horse Nation. Immediately following the screening, Maxon and BraveHeart held an open discussion about the film. They asked people to reflect on its depiction of horses as relatives with the power to heal deep wounds. Community members in the audience stood and told piercingly emotional stories about their own relationships with horses. 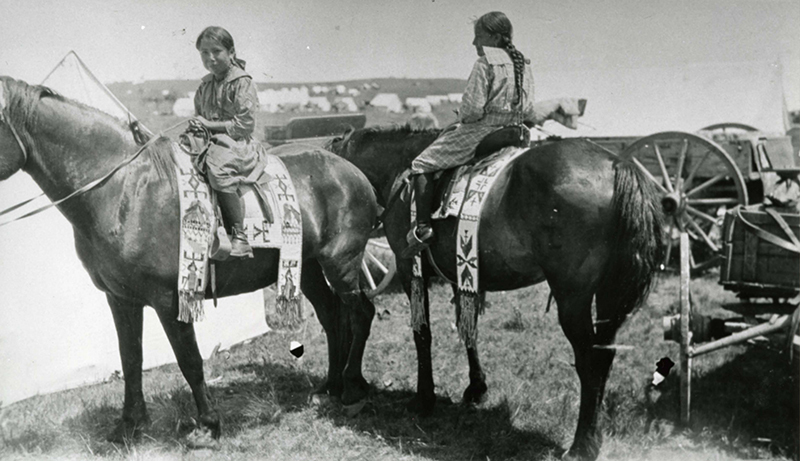 Many said that developing stronger bonds with the Horse Nation can empower Očhéthi Šakówiŋ communities, allowing them to reclaim cultural and spiritual traditions. It was the first of several community gatherings Maxon and BraveHeart organized to learn directly from the people of the Očhéthi Šakówiŋ about their kinship with horses. After that night, Maxon and BraveHeart traveled to many Očhéthi Šakówiŋ communities in two states to listen to people’s stories about the power of horses in their lives. Working together, they gathered insights from hundreds of artists, elders, culture bearers, and other community members as part of a carefully designed “community-influenced process.” By documenting their conversations, they captured the voices and perspectives of people from across the Očhéthi Šakówiŋ. That collective record continues to serve as their inspiration and guide for developing the exhibition. While they gathered reflections from community members, Maxon and BraveHeart reached out to a core group of Očhéthi Šakówiŋ artists, asking them to be a part of creating new and original works for the exhibit. One by one, some of the most prominent Native artists—including Donald Montileaux, Nelda Schrupp, and James Star Comes Out—signed on to be a part of the exhibition. 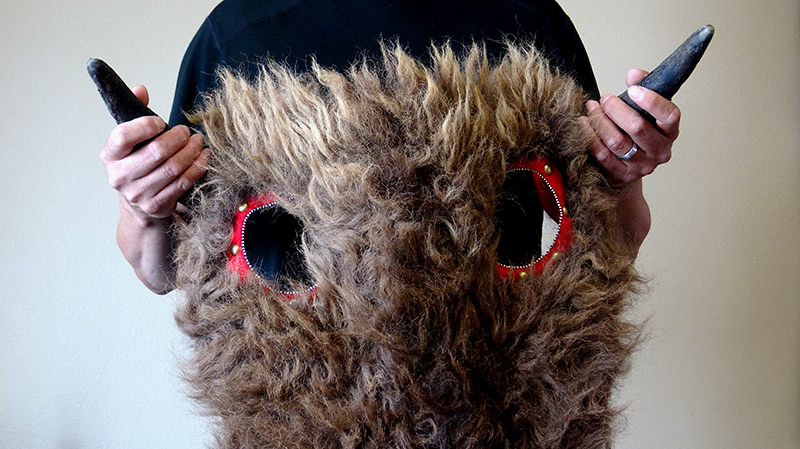 In all, 12 artists from Očhéthi Šakówiŋ communities are already creating new pieces for the exhibit. Their work includes paintings, sculpture, bead and quillwork, and more—and each piece is inspired directly by the community. When BraveHeart first approached artist Marlena Myles about the exhibition, she knew immediately that she wanted to be a part of it. “Keith was looking for Očhéthi Šakówiŋ artists to give their art to the Horse Nation projects he was working on. I felt my work belonged there—that it belonged to the people. Myles, an enrolled member of the Spirit Lake Dakota Tribe, began her career as a portraitist, using traditional mediums like charcoal. But her work evolved when she discovered the possibilities of creating art in digital formats. 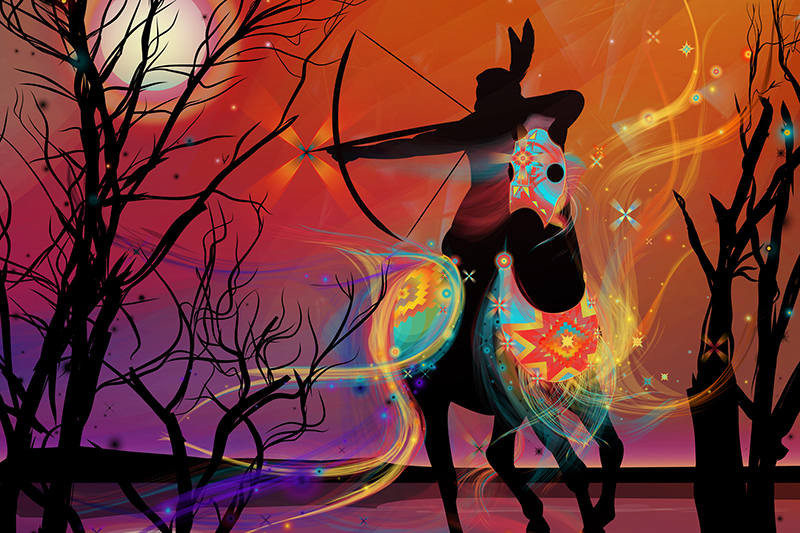 Today, in addition to working as an accomplished graphic designer, she produces vibrant digital vector drawings, laying complex geometric shapes to create images rooted in Native themes. After learning more about the exhibition, Myles was able to attend a community gathering held near her home in Saint Paul, Minnesota. There, she found inspiration in what she heard from community members. After that night, Myles began working to capture her own vision of The Horse Nation. She will contribute two pieces to the exhibition. One of them, “Above the Stars Soldier”, was created as homage to the spirituality and perseverance of the Očhéthi Šakówiŋ. 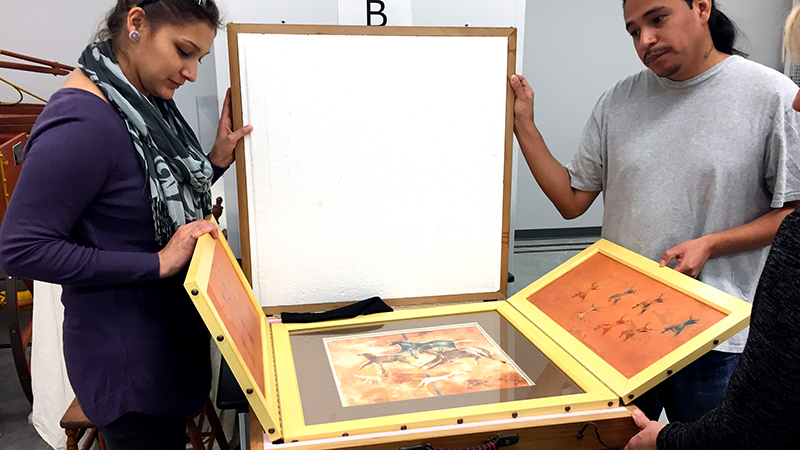 The Horse Nation of the Očhéthi Šakówiŋ Exhibition will open at The Heritage Center at Red Cloud Indian School on September 22 and travel to The Dahl Arts Center in Rapid City in the winter of 2016 and on to the The South Dakota Art Museum in Brookings through August 2017. To schedule the exhibition at your museum, please contact The Heritage Center’s director Mary Maxon at marymaxon@redcloudschool.org.